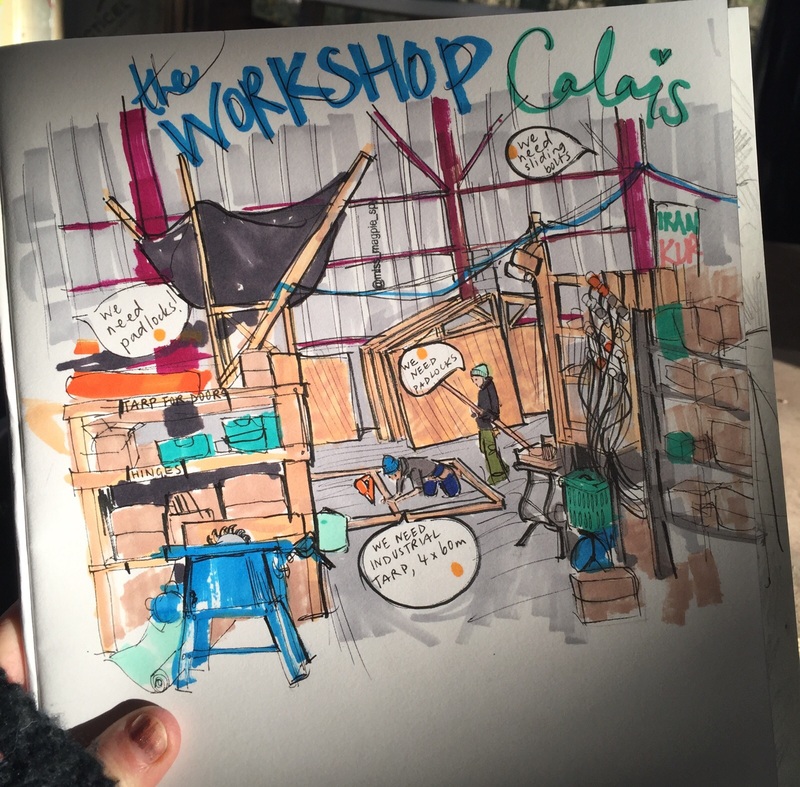 Here are some more of Miss Magpie Fashion Spy‘s illuminating and insightful illustrations – this time of the build team in Calais. Miss Magpie has been there at a crucial time, capturing the team as they work flat out to try to build shelters for everyone displaced by changes to the camp this week. The shelter building programme has been running for 3 months and Help Refugees fund and supply much of the materials while our long term volunteers oversee location and allocation. Together with refugees the team built 180 shelters in October, 400 in November and 340 in December, housing around 3,680 people. The shelters are raised off the earth, away from the cold, wet ground and insulated against the icy winds. In the first ten days of January, 78 shelters were built. This week the focus has been on re-housing everyone who needs to move from the ‘100 metre zone’ being cleared in the camp as well as physically moving existing shelters. The build team urgently need supplies, including timber, insulation, tarpaulins and pallets – as well as funds. You can donate to the shelter build fund here: https://mydonate.bt.com/fundraisers/shelter-building-calais. If you can donate goods or your own building skills please email calaisbuild@gmail.com. Please click through here to read more about what is needed and how you can provide it. So much hard work going on in the workshop! Loads of new shelters being made all the time to house people (especially the vulnerable) in the camp. In the workshop they need more padlocks, more sliding bolts, and more industrial tarp. Or money towards those. Please help Help Refugees if you can. Follow Miss Magpie and Help Refugees on Instagram for updates as they unfold.